Successful innovations are fueled by collaboration and community, so Stanford Brainstorm is building a network to unite key stakeholders in the brain health innovation ecosystem. We host events to identify the most important ideas, challenges, and potential in the field - and to get you talking to each other about them. We facilitate sharing what works so that others can build upon proven successes. Solving problems in brain health requires expertise from many different disciplines and backgrounds, which is why we invite people from all over to join us in our mission. Based out of Stanford, we get to call the world’s leading incubator of innovative ventures our home - but that's just the starting point. Whatever your background, wherever you are from, we welcome you to join us and make Brainstorm your intellectual home. The Brainstorm-ing Sessions are monthly meetings of stakeholders interested in brain health entrepreneurship, innovation, and technology. Discuss key opportunities and challenges in the field. Showcase your idea to receive feedback from fellow innovators and domain experts. Meet the stakeholders invested in brain health and work together to drive the field forward. We celebrated our launch by celebrating the role of innovative ventures and technologies in solving the pressing brain health problems of today, including stigma, access, and quality of care. Guests heard from leading entrepreneurs at all stages and discuss key challenges and opportunities to move the field forward. We were thrilled to partner with Stanford's Center for Entrepreneurial Studies and the Stanford Graduate School of Business Healthcare Club. We hosted the first ever Virtual Reality and Augmented Reality Innovation Lab, where we selected the most promising ideas that use AR/VR technology to advance brain and behavioral health. 5 Finalists pitched their ideas to an expert panel of judges and audience members during the Brainstorm VR/AR Innovation Lab at the Stanford Innovations in Psychiatry and Behavioral Health Conference. Prizes were awarded to the winners. Through our Brainstorm Medical Innovation Bootcamp and Social Innovation Lab, we have guided over 200 students through developing projects that address problems in mental health and neuroscience as a part of the Clinical Neuroscience Immersion Experience and international Clinical Neuroscience & Research Experience at Stanford University. We continue to mentor select student ventures after graduation. 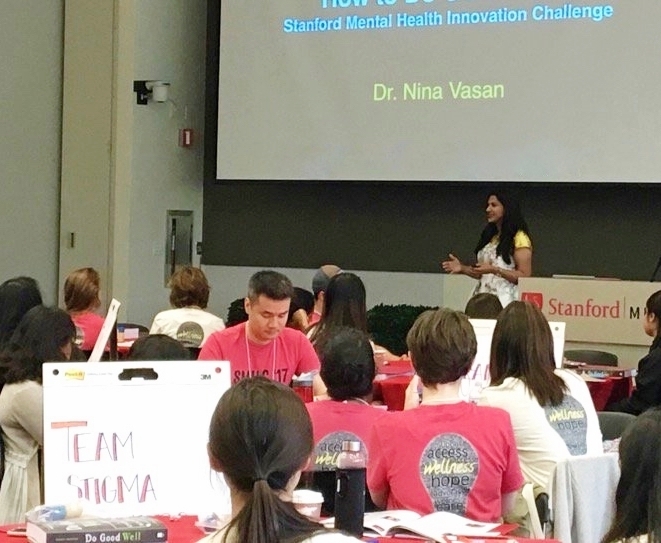 We taught 100 Bay Area high school students at the Stanford Center for Youth Mental Health and Wellbeing's Stanford Mental Health Innovation Challenge how to understand the causes of mental health problems in their communities, develop ideas to address these problems, and pitch their ideas. Winners received grants from the Center and Lucille Packard Children's Hospital to implement their ideas. Ready to make an impact? Create your venture by partnering with Brainstorm.